In 1933, Charles J. Noke developed a new type of figural Toby jug showing only the head and shoulders rather than a full-figure as had been done since the 1700s. Noke designed a series of jugs of famous people or characters in English history, literature, and song. Sairey Gamp was a nurse in the novel Martin Chuzzlewit, written by Charles Dickens in 1843–1844. Her caricature was popular with the British public. 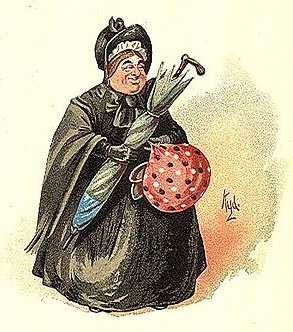 A type of umbrella became known as a gamp because Mrs. Gamp always carried one. The miniature size of Sairey Gamp was issued between the years 1939 to 1986. The Royal Doulton B9 underglaze mark is applied, along with the numerical code of 15, dating this piece to 1942. During this period, Royal Doulton began dating their wares in 1927 and added a code number next to the lion and crown emblem. Each successive year after 1927 was indicated with a number; thus 1927 + 15 = 1942. Hand painted details highlight Sairey Gamp's grizzled face, framed by a white head cloth and greying hair beneath a black head covering tied with a bright green cloth. A hunter green coat is accented by a yellow and burgundy bow. A figural umbrella handle is one of the first examples of the use of this detail to reflect part of the story of the character depicted. Sairey Gamp's name is inscribed along the back of her coat. A hand-painted dot and slash symbol is present on the bottom markings. The character jug measures approximately 2" in length, as measured to include the tip of Sairey Gamp's nose, and 3 1/4" wide, including the spout and extending umbrella handle. It is 2 1/4" high, as measured to the top of her hat.